How much does GetSocial cost ? 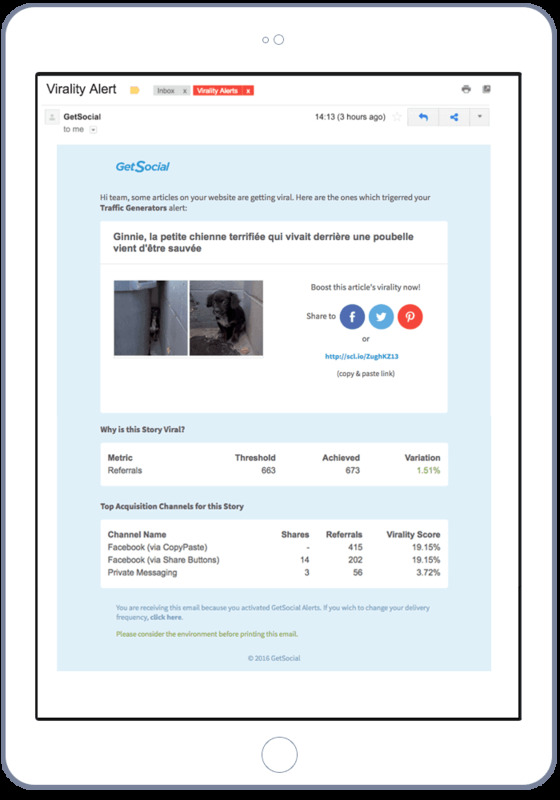 The pricing for GetSocial starts at $185.0 per month. 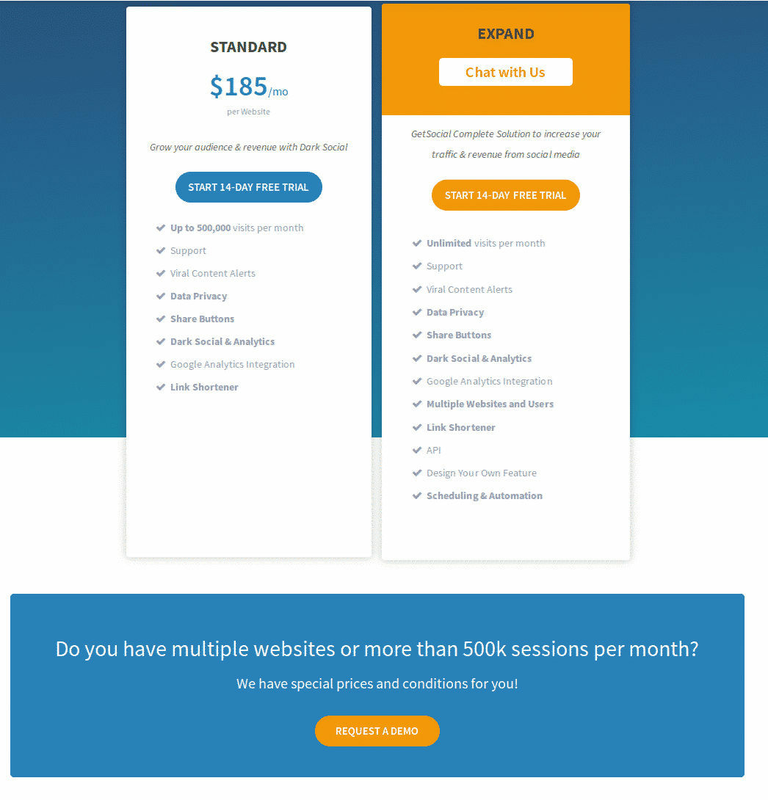 GetSocial has a single plan - Stard at $185.0 per month. GetSocial also offers a custom plan based on the customer's request.
" 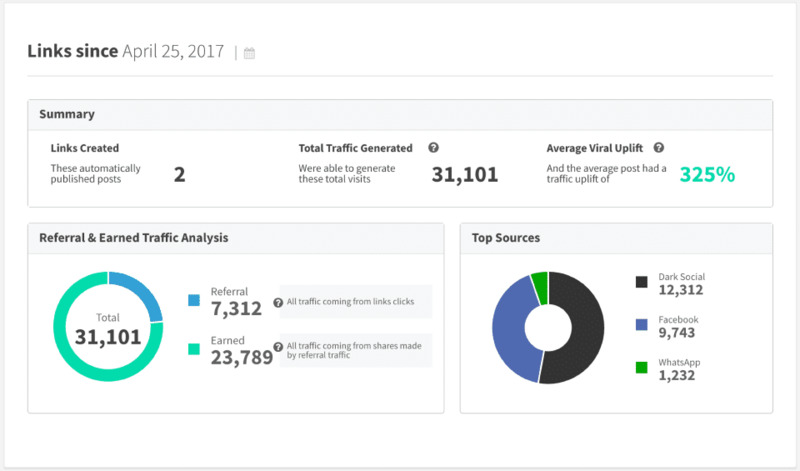 The best experience for the analysis of your social media content"
"Optimize your audience and the traffic of your content on social networks"
Pros: They have a 2-week free trial which allows you to test all the features and see if it's a good fit. They also have a viral alert feature that notifies you when your content starts picking up steam. Cons: The price is a bit excessive for the average solopreneur. It would be nice if they added a lower priced plan. Hi Mandy, thanks for your review. I agree with you on the pricing and I'm happy to say that we're implementing some changes that will make the product more affordable to our small business/solopreneur users. Cons: It doesn't have all of the functions that I would like so sometimes I still work with the platform directly. 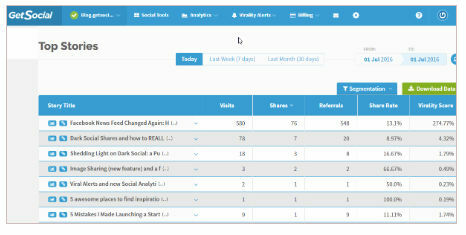 This can be used by any novice to track all your social traffic when and where it is becoming viral. Cons: I didn't find anything negative to report with the performance tools. The pricing could be more affordable. Pros: This software is best for its analytics. It provides data that you won't really get from other software and this data is crucial to understanding your social media post effectiveness. Cons: Only con is it takes a bit to get used to. You definitely need to take time to learn the software and maximize its benefits. Simple, appealing design, no much worries. Works well on mobile devices. Pros: Mailchimp integration, the way number of shares appears on the website. I also like the choice of different tools integrated, a possibility to choose the orders, the diversity of placements within the site. Cons: Sometimes certain options don't work - for instance, I tried to put sharing buttons on the bottom of my posts/pages, but it always appears both on the top and on the bottom, which I don't like that much. Hi Anomandarist, It's awesome to hear that GetSocial is helping you save that precious time for your projects ;) Regarding the pop-up, I'm going to follow up by email when my colleague from the product team implements a fix! Pros: the ease on integration and the automated features they offer is for sure a selling point for me. Being also a designer I appreciated the non intrusive design, it blends well with the websites they are on. GS has also a great customer service, they also jump into the issues (if you have any) and help you solve it...fast! Overall: nr 1 is exposure to new visitors on the website, better traffic. Hi Bogdan, We're glad you appreciate the ease of use. As you know, it's quite hard to make something easy :) Thanks a lot for the review and, as you know, if you need anything just send a message to support@getsocial.io and we'll take care of it! Cheers!